Ordering a custom cover can be a bear of a task. First you need to decide whether a custom cover is necessary, then you have to measure your pool and then hope beyond all hope that you did it right. This can be a lot to ask from a new a pool owner doing this for the first time. So I figured I would walk you through the different sections of our custom pool safety cover form to make sure your custom cover measurement and installation go according to plan. Fill in your shipping and contact information so we can estimate any taxes or extra shipping fee (custom covers include free shipping in the 48 contiguous states). Your email is needed so we can forward the official quote to you. If we have a question about your measurements, we either email or call you, so make sure these are accurate. 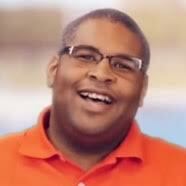 There are two categories of pool safety cover – mesh and solid. However, within those categories there are different grades of material. Below is a breakdown of the pros and cons of each. The AquaMaster and solid covers come with an option for a built-in mesh drain in the center or a completely solid cover that comes with a pump to prevent sagging and dirty water puddles as these covers do not naturally drain standing water. To avoid standing water, the solid and AquaMaster covers are available with Mesh 95 drain panels. The Mesh 95 panel allows for steady draining of water and whole blocking of most sunlight and dirt particles. 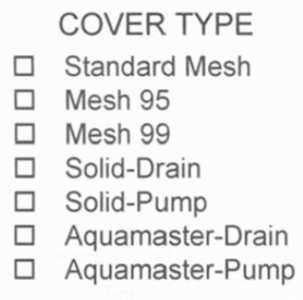 Though the drain uses Mesh 95, pool owners who are anxious about water run-off and dirt tend to go with the second option, namely the cover pump. Solid covers without a mesh section completely block all sunlight, and most dirt and water. But with that super secure seal on your pool, you face a new problem – standing water. The cover pump is placed in your cover’s puddles to remove standing water via an attached garden hose. The cover pump’s downside is the pool owner’s need to be more vigilant during the off-season. Standing water puddles are magnets for dirt and leaves that if left to sit will degrade the material. These are not a set-it-and-forget-it type of deal. Color choice is strictly the customer’s preference and does not affect the cover’s durability. 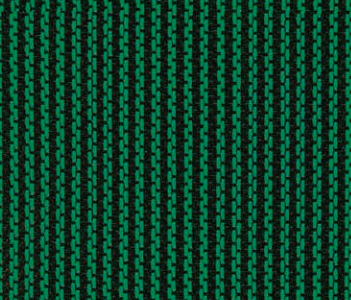 As you can see, some covers are only available in blue or green, while the base standard mesh is available in every color, even the coveted black. The strap spacing of a cover refers to the distance between anchor straps. The standard strap spacing for a rectangle or more common specialty pool shapes like ovals, standard Ls and Grecians are 5×5. The 3×3 is only necessary for free-form pools, whose curvy pool edge requires the cover to be more contoured. The more curves a cover must contort to, the tighter the straps have to be to prevent a slack cover edge that can catch wind and buffet. When a cover starts to buffet it looks like there is a bunch of invisible kids jumping on the cover. It may look fun, but this damages the cover and could lead to an anchor breaking loose. You can request that a cover be made with 3X3 spacing, but it ups the price significantly. If your pool has a step, here is where you will note the location (left or right,) size and whether the step is edge, flush or offset from the pool corner. If your step is offset, provide the length of deck between the edge of the pool step to the closest pool corner. Deck space – A safety cover strap requires 36 inches of decking to tension the springs and suspend the cover over the pool. If your deck width is shorter than 36 inches, please note on the drawing of your pool shape that measurements are shorter than 36 inches. Deck type – When measuring 36 inches from the pool deck, also take note of the surface. This will determine what type of anchors is needed for the application. Diving board – If your diving board is closer than 18” to the pool’s edge, the cover may require a Y-strap to anchor the section properly. Non-removable objects – This includes rails, ladders, waterfalls and spas. If it hangs over the pool’s edge or is within 18 inches of the pool edge, mark it down. This is where we get to the good stuff, namely the measuring of the pool. 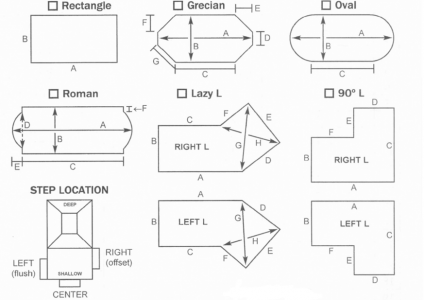 There are six common pool shapes listed, with assigned letters corresponding to necessary measurements. List the pool dimensions on the spaces to the left. If you own a free-form pool, we have something very special for you (insert evil laugh), skip to the next section called A-B measurements. Measuring a pool is generally a two-man job and can take as little as five minutes or an hour, if you have a free-form. Oval – The ‘C’ length is a measurement of the straight on the side of the oval. Measure only the straight length of the oval, before the end starts to curve. Roman – The ‘D’ is the width of the rounded portion of the pool end. Do not include the straight lengths on either side, these are to be listed on the ‘F’ length. Lazy L & Standard L – The ‘H’ and ‘G’ are hard because it must be pulled taut over the pool to get an accurate measurement. You may want to call over a third person to help with these two. 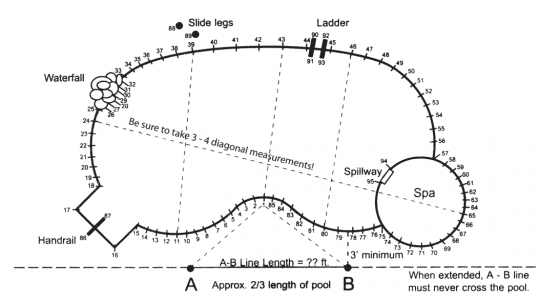 The process of A-B measuring your pool is a system of measuring that triangulates the twists and turns of your pool deck. I know that sounds difficult, but with a good helper and a long measuring tape you can make quick work of it. Draw a chalk line that’s approximately two-thirds the length of the pool along the long side of the pool. Label one end of the line ‘A’ and the other ‘B’. For example, if your pool is 36 feet long, the line would be about 24 feet long. The A-B line must be a minimum of three feet from the pool’s edge. Using chalk, mark a line every three feet around the pool’s edge, mark every one to two feet for sharp corners or curves. Number each mark in sequential order. After the pool perimeter is numbered, mark each non-removable obstruction that is within 18-inches of the pool’s edge. Obstructions to be noted and measured are diving boards, slide legs, attached spas, rails, and ladders. Measure from point ‘A’ to point one, then point ‘B’ to point one. Record measurements on the A-B form. Make three to four diagonal measurements across the pool, noting which numbered marks you are measuring from. 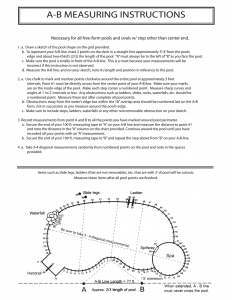 For in-depth steps on how to complete A-B measurements for a safety cover, view the image to the right. We have a 16 X 33 oval pool, which I believe is a standard size, with a wood deck around the whole pool. Does the safety cover come in a standard size? What is the normal overlap of a safety cover? Safety covers in a range of sizes, but the stocked covers are only designed for square inground pools. These covers also come with a cement anchors. Because your pool is oval, has a wood deck and may have some other non-standard points you would require a custom cover. 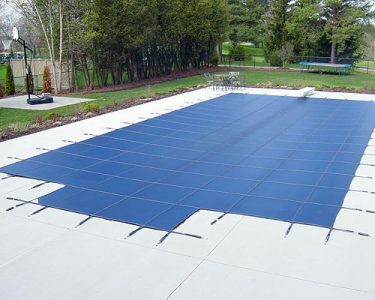 The safety cover requires 36-inches of deck around to pool to anchor it properly. If you do not have that much deck, then you would need to note that on the measuring form as well.